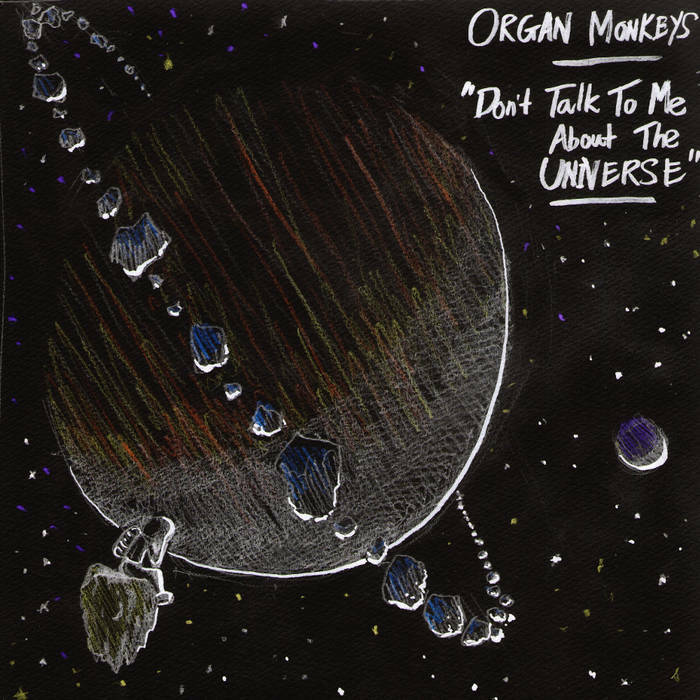 “Organ Monkeys” is an ongoing musical project by Joseph Sanger. After a few failed attempts to get things going at the start of May I finally hit upon using a looper as a quick and easy method of getting ideas down. I was partly inspired by Tom Waits’ more recent recordings in which, despite being unable or unwilling to beatbox conventionally (if such a thing could be called conventional), he used loops and live sampling to create rhythms with his voice. As I don’t have a drum kit and find programming drums very uninspiring, it seemed like a good starting point. The “intro” and “outro” were the first things I did with the looper, as proof-of-concept. They are improvisations with voice and shakuhachi, recorded through my webcam mic. I knew I wouldn’t manage to write ten songs with lyrics during this project, so I had Bowie’s “Low” album at the back of my mind – the “A”-side (tracks 2-5) is more conventionally song-based, and was recorded when I could find time during the day; while the “B”-side (tracks 6-8) is more experimental and progressive, and largely came together later at night. I’ve found this project extremely inspiring. Doing it has motivated me not only to be more creative, but also less critical of my own ideas. It’s been an extremely valuable experience for me. Voice, mouth percussion, hand percussion, shakuhachi, fretless bass guitar, keyboard/soft synths, 5-string bluegrass banjo, home-made 5-string fretless banjo, Sooperlooper (linux software looper) and various MIDI devices. I recorded the whole album on Ardour, a free Linux DAW, using a Rode NT-1 microphone. For more info about Joseph Sanger, videos, music and writing please visit josephsanger.com.